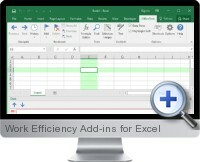 The Work Efficiency Add-ins (OfficeTent) consist of a collection of tools that provide fast processes to transform and manage data and content within Excel for saving time and improving work efficiency. The efficiency add-ins can be installed for Excel 2007 or higher on either 32-bit or 64-bit versions of Excel and provide a new menu item with access to all utilities. Bookmark - add bookmarks to cell references in order to quickly navigate back and forth between ranges. Advanced Find and Replace - support for setting multiple conditions to find and replace content with options for wildcards and regular expressions. Case Changer - upper and lower case conversion options with support to apply to individual words and sentence parts within text content. Batch Text Processing - a wide range of text manipulation and sorting options that can be applied to multiple cells ranges in batch process. Data Window - displays editable information concerning parts of data tables to facilitate analysis and formula management on large ranges. Adding Text - inserting text content within content as prefix, suffix, fixed position and conditional search. Text Extraction - isolating and extracting specific text strings within ranges with options to remove, replace and export content. Reverse Ordering - change the sort order of text content across or within cells using delimiter options. Highlight - highlighting cells and ranges based on content to speed up visual navigation. Navigation History - recording of selected cells and ranges to provide navigation based on recorded history. Customized Shortcut Commands - create additional keyboard shortcut commands to perform commonly used tasks. Selection Assistance - create multiple conditions to rules that then select cell ranges based on the criteria met. Formula Editor - a dedicated window which can be viewed in full screen provides advances formula management and auditing functionality including syntax highlighting, auto-complete and zooming. Delete Functions - a variety of methods to remove text content for cleaning data including options to target spaces, numeric, non-numeric and special characters at specified positions.